At a Glance: Easy-to-swallow capsules Leucine, isoleucine, and valine in 2:1:1 ratio Supports muscle building and recovery efforts Milligrams of BCAAs: 1,000 Capsules per serving: two Optimum Nutrition BCAA 1000 Caps contain a potent balance of branched chain amino acids (BCAAs), which are building blocks of muscle mass. BCAAs are essential because the body cannot make them from other compounds. These easy-to-swallow capsules metabolize directly in the muscle, helping to repair and rebuild muscles after workouts and facilitate quick recovery. BCAAs may improve nitrogen retention by sparing other amino acid groups for repair and rebuilding. 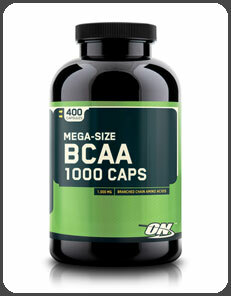 Optimum Nutrition BCAA 1000, 400 capsules.